Your flight to St. Maarten has been canceled! What can you do? Not only is the flora rejuvenating, the fauna is returning, too. 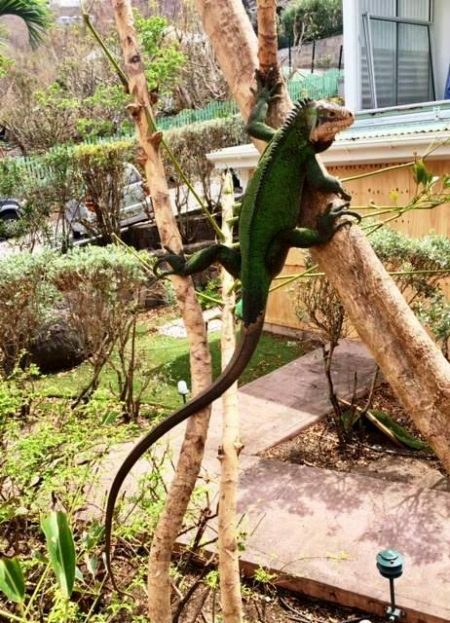 An Iguana was spotted shortly after the hurricane, while another appeared in Marigot two weeks later. The miracle of the camouflage amazes me. All creatures adapt. September 20, 2017 – 2 weeks later – so happy to see our friends are ok. Photo courtesy of Le News. The children went back to school on Monday September 25th and La Poste in Gustavia opened the same day, although it’s not 100% operational. 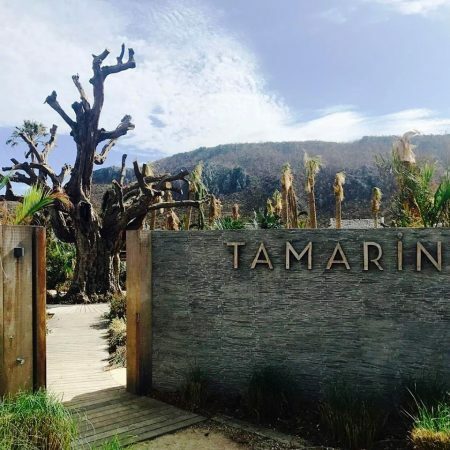 We are thrilled to see that Le Tamarin is reopening in time for Thanksgiving. I love dining there. I am sure that much of the foliage that you see in this photo will be lusher by then. Concierge Julia Hurd will be happy to book reservations for you. The St. Barth ancestors knew exactly how to build their homes, called “cases” and did so according to whether their land was windward or leeward. The island is still in recovery mode and doing its best to be ready for you. 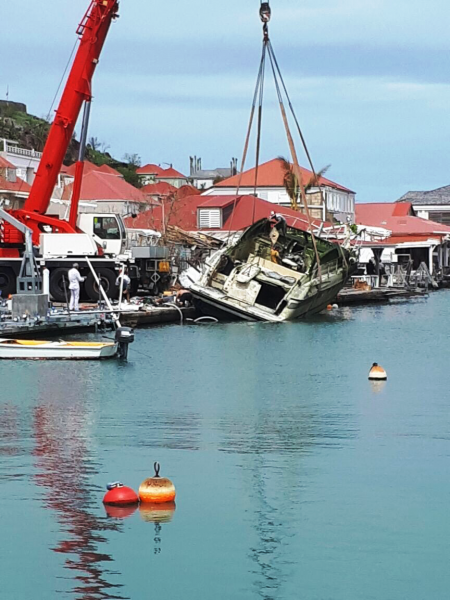 September 29, 2017 One of Masterski Pilou’s boats is hauled up after sinking in the harbor. Don’t worry he has more for you. Our clients want to keep their reservations and come to St. Barth as planned, even if they can’t dance on the tables at Nikki Beach or have lunch at Cheval Blanc. 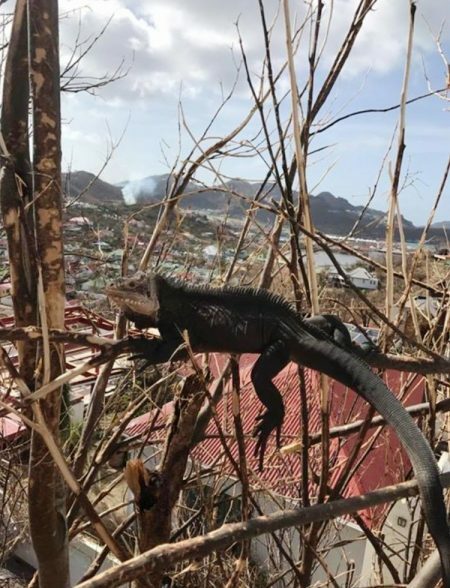 We are facing an unfortunate obstacle: Many people have booked their flights through St. Maarten (SXM) and the airlines are canceling their flights! 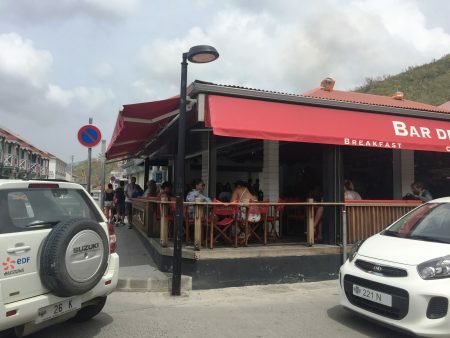 They want to support the island by coming but now they can’t get to St. Barth by connecting from there. What to do? We have the answer! Check the airlines that fly from your airport to see which of them fly to San Juan (SJU). If your airline does have flights, we can make arrangements for you to fly directly to St. Barth! I connect through San Juan on Tradewind Aviation all the time. It is so easy. Although hard hit by Hurricane Maria, the airport is open. Our thoughts and prayers are with Puerto Rico and hope they will be on their way to recovery, very soon. Depending on the time of year and the day of the week you are traveling, you can depart San Juan as early as 6:45 am and return from St. Barth starting at 8:20 am until 5:20 pm or later. Many of you know that the airport in St. Barth closes at dusk, so bear in mind that the last flight to St. Barth this fall departs at 4:00 pm. Once the holidays are over, they depart SJU at 4:30 and that flight gets later and later as the days get longer. Tradewind also offers service from St. Thomas (STT) and Antigua (ANU). 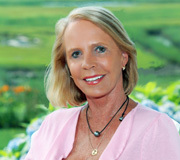 Our concierge in the US office, Julia Hurd, can make the connecting flights for you. 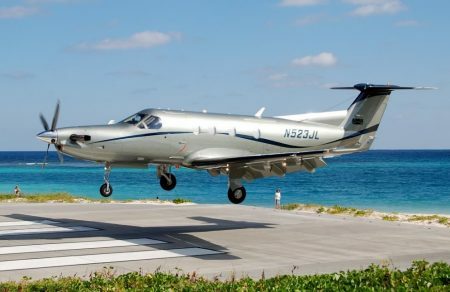 Tradewind’s beautiful Pilatus PC-12 is air-conditioned and offers passengers snacks and drinks during the approximately 1 hour flight from San Juan. If you can’t get a flight to San Juan and you purchased the travel insurance we offered you, and you have proof that your flight to SXM has been canceled, you are covered for reimbursement and can file a claim. For those who did not purchase the insurance, please contact your St. Barth Specialist about rolling over your reservation to a future date. We continue to gather information on the status of our villas and your Specialist can offer you a different villa if yours won’t be ready by the time you travel.